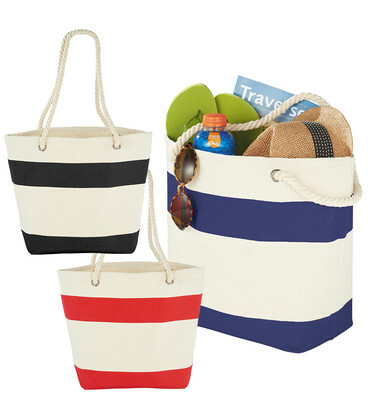 Show your stripes with this sturdy nautical tote, perfect for the beach or getting around on the weekend. Open main compartment. Available in 2 colours. Soft cotton rope handles and graphic silk screen print make this tote stand out. 10 inch handle drop height. No business card holder featured. Dimensions 455mm(w) x 336mm(h) x 170mm(d).